If you are familiar with the titles from Antarctic Press then you know that they have an affinity for Manga inspired comics. As a comics reader, I am not that fond of Manga or Manga inspired works, but Antarctic Press is an exception. Personally, I have always been impressed with their work and it is good to see an independent publisher stay afloat during these god-awful economic times. Like many publishers of comic books, Antarctic Press has some zombie themed offerings that are worth reading. Battle for the Planet of the Living Dead #1 which was written by Joe Wight and featuring the art of Rod Espinosa is a another great work for zombie fans. This first issue follows a man named Adams who lives on a planet known as Kaiser Sigma. Adams is a blue-collar guy who works for the industrial firm that pretty much runs the planet. Adams' typical day comes to an end when a space freighter crashes into his place of work. The freighter opens and from the wreckage we see a swarm of zombies. They are attacking the planet and Adams has no choice but to run for his life. Security clears up the area but their success is short lived. It is Adams who saves the security force only to see more zombies coming his way. 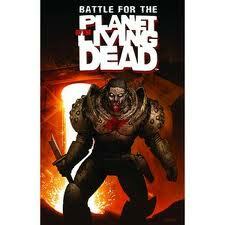 Battle for the Planet of the Living Dead #1 is a great first issue by the creative team of Wight and Espinosa. Wight's script is pretty well paced and the main character, Adams, is not a one-dimensional lead. He has the strong-guy angle but also has a friendly and humorous side as well. Adams is the kind of guy you can relate to and root for in a horror story. This is my first time reading a story by Wight, so I can not determine if he's one for dark humor or not. The reason I mention this is that there is a panel that seems to be unintentionally funny. While the zombies advance on the security forces, we see the zombies throwing something at the force. What they are throwing are zombie heads that are somehow still alive and are able to chew up the face of a security force member. I laughed at that panel and I'm hoping Wight was going for humor with that one. If not, that was a swing and a miss. Espinosa's artwork is very good. His panels are pretty clean and I really enjoyed the fact that the comic is printed in black and white as opposed to color. The black and white worked well for this issue and there are a few panels where Espinosa does some amazing work. One example is a view of the industrial area where Adams works and another great example is the panel where the zombie's crash a freighter into the industrial area. Please note that this title is for mature readers due to dialogue and violence. I am definitely checking out other issues for this title and this one is for zombie fans looking for an awesome sci-fi connection. In my opinion this is Aliens 2 where the zombies have replaced the aliens. And this one doesn't have Hudson screaming, "Game over!"